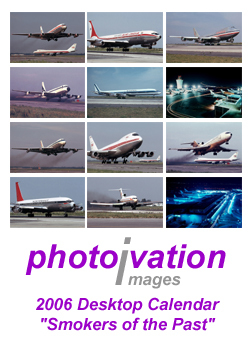 Photovation's Aviation Theme calendars were designed to include photos based on specific themes, for example, Classic 747s of the 1970s, Warbirds and the Concorde. 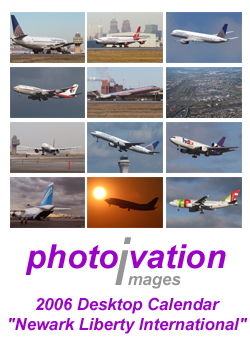 Each calendar contains 12 high quality images matching the calendar's theme. These are real photographic prints and not computer generated images. 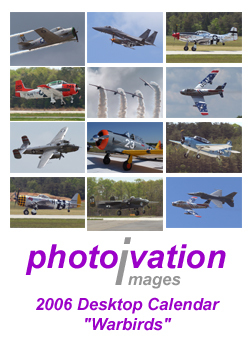 Photovation's 2006 Aviation Theme Calendars are available in two popular sizes, 4 x 6 inch and 5 x 7 inch, each designed to be displayed using standard plastic frames. Display them on your desk using a plastic bent frame or on your refrigerator using a magnetic frame. The countdown began early in 2003 when Air France announced the pending retirement of their Concorde fleet on May 31st. British Airways soon followed suit announcing its last commercial Concorde flight would be October 24th. 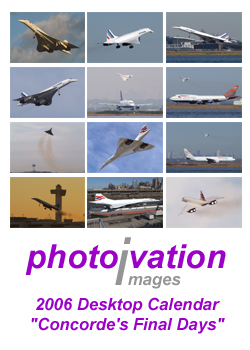 Photovation's "Concorde's Final Days" calendar contains images from those last months of commercial service. Images of Air France's and British Airways' final flights are included as well as an image of British Airways' G-BOAD Concorde at her final resting place at the USS Intrepid Museum in New York City. The Heavy 3-Holers calendar features images of DC-10s, MD-11s and an L-1011 aircraft, several depicting airliners no longer in service. 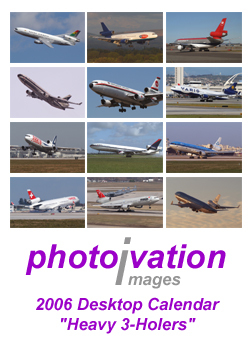 The calendar includes images of Delta's MD-11 in "Widgets" and "transition" colors; Northwest DC-10 in old and new colors; Swiss International MD-11; Ghana Airways, MyTravel and Biman Bangladesh's DC-10s, and KLM's "Audrey Hepburn" MD-11. Also featured a beautiful rotation photo of an Arrow Air L-1011. A must have for the Heavy 3-Holer enthusiasts! Departing 31L traffic at JFK is required to make a left turn for noise abatement over Howard Beach. Heavys, with their fuel and passenger loads at the limits, make beautiful banking turns allowing photographers to capture some stunning photos. 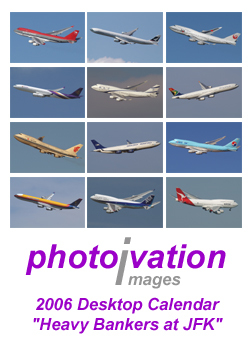 The Heavy Bankers at JFK calendar features nine photos of heavy aircraft departing 31L, two departing 13R and one inbound to 13L, all displaying a beautiful banking attitude. Bring this calendar home with you and enjoy JFK bankers all year long. Unfortunately they are almost all just a fond memory today. British Airways "World Tails" were widely seen and loved by admirers worldwide. It wasn't, however, enough to convince British Airways to maintain them. They began disappearing from the world's airports in 2003 and with few exceptions are mostly gone today. 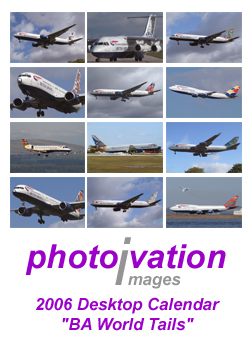 The "BA World Tails" calendar features various British Airways, and two commuter airlines, photographs with each showing a different world tail. One photo shows a BA 747 with the popular "Wanula Dreaming" tail at the end of 04L at JFK while the British Airways Concorde soars overhead after departing 31L. A definite collector's item. Ask any aviation photographer where they'd love to go and take pictures and it's almost a certainty the answer will be St. Maarten, Netherlands Antilles. Where else can a photographer combine, heavy aircraft metal, bright sunshine, sand and the beautiful azure blue color of the Caribbean Sea in a single picture. Enjoy the St. Maarten Images calendar with outstanding images of the action that is only St. Maarten. 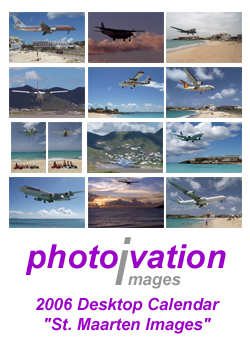 Buy your St. Maarten Images calendar today! The Heavy Cargo Metal calendar features cargo aircraft from some of the world's best known cargo airlines. Long a favorite of the aviation enthusiasts because many cargo airlines fly older aircraft no longer seen routinely in passenger service. Enjoy twelve stunning shots showing these heavy cargo aircraft at their best. 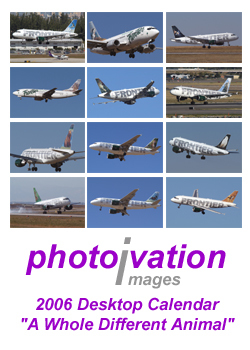 Frontier Airlines has been around for years surviving today as a low cost airline based out of Denver. With its reinvention as a low cost airline came the slogan A Whole Different Animal and the now familiar wildlife images adorning the rudder of the aircraft. For those in Denver these tails are common, but outside of Denver they are rare. At a rate of one or two flights a day it would take a lifetime to capture all the different tails. To do that you need to visit Denver, or for a quicker and less costly alternative buy A Whole Different Animal calendar and enjoy twelve different tails over the next twelve months! Where have all the smokers gone? Gone to the boneyard almost everyone. Step back thirty years and you are almost at the beginning of the commercial jet age. Things were much different then. Departing aircraft more often than not left long trails of dense dark smoke behind them routinely. Something rarely seen today. While our environment may be cleaner and less noisy, we still miss the airliners of the past that were known for these heavy smoke trails. The Smokers of the Past calendar brings these aircraft back to life for the next twelve months. What can you say about the Boeing 707 that hasn't already been said. Along with the Douglas DC-8 the Boeing 707 ushered in the jet age for commercial aviation. It may not have been the first jet in commercial service, but it certainly is the one that took it to forefront. The Boeing 707s reign lasted into the 1970s. Unfortunately there are few flying today outside of military aircraft. 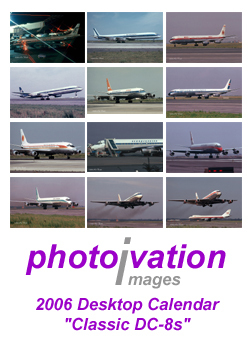 This calendar features 12 examples of the Boeing 707 taken at John F. Kennedy International Airport in 1971. Airlines featured include Air India, Pan Am, TMA, BWIA, TWA, American, Aer Lingus, BOAC, Northwest Orient and Avianca. Without a doubt one of the most successful aircraft to ever serve in commercial service. For over thirty years this trustworthy and sturdy work horse served the nation's airlines well. Only recently retired the 727 was the best. 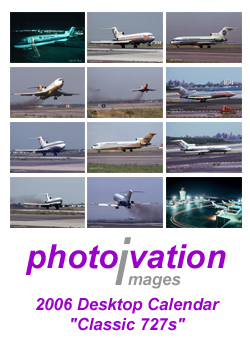 This calendar has twelve examples of early 727s taken at John F. Kennedy International Airport in 1971 and LaGuardia Airport in 1973. 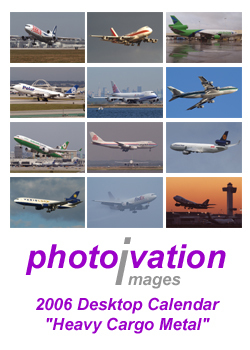 With the exception of two photos the airlines pictured on this calendar no longer exist. Airlines featured include Eastern, National, Pan Am, Northeast, Braniff, American, and United. Today we travel to the airport and look around to see many examples of the Boeing 747 in service today. The great grandchildren of the aircraft pictured in this calendar. 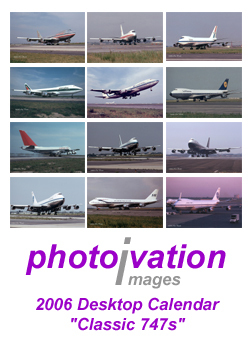 Eleven examples of 747-100s and a single 747-200 make up this calendar of early Boeing 747 aircraft. The photos were taken at John F. Kennedy International Airport in 1971. Airlines featured include American, TWA, United, Alitalia, Eastern, Lufthansa, Northwest Orient, Pan Am, BOAC and SAS. The Douglas DC-8 has seen widespread service over the last forty years with many examples still flying with today's cargo fleets. Along with the Boeing 707 the Douglas DC-8 ushered in the jet age for many commercial airlines. 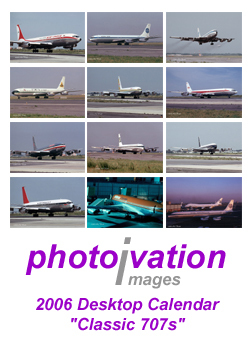 This calendar features 12 photos of the DC-8 taken at John F. Kennedy International Airport in 1971. Airlines featured include Air Afrique, Eastern, Iberia, Overseas National, Viasa, Loftleidir Icelandic, National, Scandinavian, Saturn, Trans International, United and Aeronaves de Mexico. The US Navy Blue Angels is known around the world for their breath taking flight demonstrations at airshows. 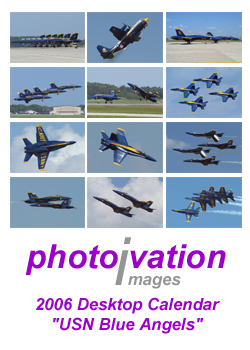 The USN Blue Angels calendar features eleven photos of the Blue Angels F/A-18 Hornet and one of Fat Albert Airlines demonstrating its JATO assisted takeoff, a crowd thriller. Most of the photos show the thrilling action that only the USN Blue Angels can provide to airshow audiences and include ... formation takeoff and flybys, inverted flight, and the solo performers meeting head-on at a closing rate of 1,000 mph. A must have for the Blue Angels enthusiasts! For those of us old enough to remember the Warbirds calendar will surely invoke memories of an era long since past. The Warbirds calendar features ten photos of World War II era aircraft including the P-51D Mustang, P-47 Thunderbolt, B-25 Mitchell, A-6 Avenger, T-28C Trojan and AT-6 Texan, and two of the Korean era F-86 Sabre jet. Two photos show Heritage Flights, one featuring an F-15C Eagle and P-51D Mustang and the second an F-16 Fighting Falcon and F-86 Sabre, the old and the new in formation for all to enjoy. 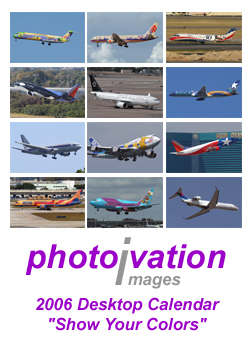 This calendar features 12 images of different special schemes including four celebrating anniversaries for their respective airline ... Spirit Airlines 10th, Delta's 75th, Skywest's 30th and ASA 25th. In addition enjoy America West's Teamwork Coast to Coast, Nevada and Arizona, Southwest's Shamu and Lone Star, ANA's Pocket Monseters, BMI's Star Alliance and Ryanair's Eircell special colors.